It's time to head for the hills this coming Saturday! Brandon Hills, that is! 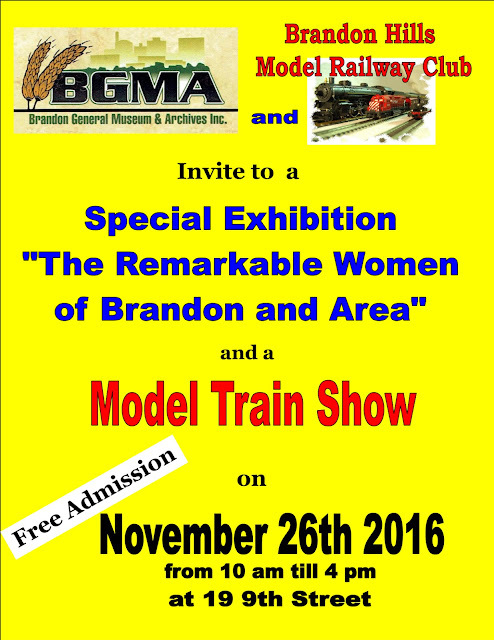 The Brandon Hills Model Railway Club is holding an open house in conjunction with the Brandon General Museum and Archives, where they're housed. The club has been in existence for over 30 years. Besides having a great HO layout with a beautiful hand painted backdrop, they also have an N gauge layout and G scale trains on display. The museum is located in the former Manitoba Telephone Service Building at 19-9th Street in Brandon. It will also be holding a special exhibition, titled "The remarkable women of Brandon and area", so be sure to check that out as well when you're there! The hours are from 10AM to 4PM, and admission is free! The CP Holiday Train is coming to town!